A Date. For example, you have the ‘last purchased’ date as a custom field next to each subscriber and want to start a Win-Back Customer email series. An Anniversary Of A Date. Perfect for sending Birthday cards or for any other anniversary date. For this trigger, you need to have a defined date custom field information for each subscriber. The system will require date formatting and automation will start each year automatically. Subscriber Joins A List. 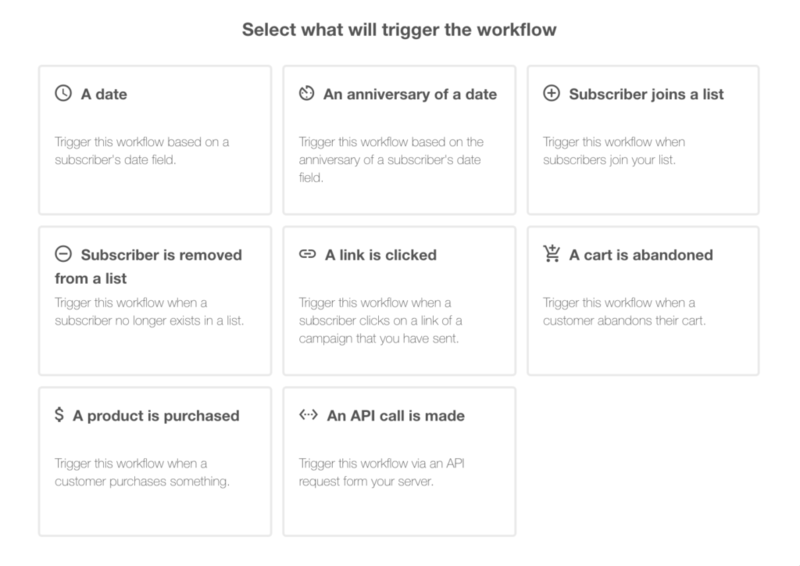 This automation workflow will be started when a subscriber is added to a certain subscriber list. Pick this one if you’re collecting subscribers via Forms or through API calls and would like to send Welcome emails or Educational campaigns for newcomers. Automation will NOT be started if the subscriber is added manually or imported from files. This workflow can only be triggered by forms or API calls. Subscriber Is Removed From The List. The automation will start whenever the subscriber is removed from a defined list. A link Is Clicked. Automation would start its first action whenever a subscriber clicks on a specific link. For example, this might be a link to a certain product or a link to a pricing page. After they click a link, send a second email, copy all these subscribers to an ‘Interested in product X’ list, or get notified when somebody clicked on any of your call-to-actions. The link has to be included in the previous campaign emails. Cart Is Abandoned. Abandoned cart reminders might be a great source of revenue. It starts the automation workflow once a cart is abandoned. Send them emails, add to tailored made lists and get notified if a cart is recovered. Requires e-commerce integration! A Product Is Purchased. Send customers Thank-you letters, post-purchase feedback requests or get notified when somebody buys your product or service. Requires e-commerce integration!